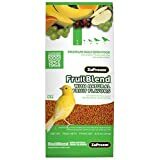 ZuPreem Fruit Blend Medium Parrot Food From ZuPreem, the most popular pellet food brand in the U.S., FruitBlend Flavor Premium Bird Food provides hook bills and softbills with 21 essential vitamins and minerals. And birds are crazy about the taste- even the most finicky birds! Developed to benefit long-term health and to bring out the colorful best in your feathered friend. Features: Pellets are sized for Conures, Amazons, Greys, Pionus, Caiques, Senegals and other medium to large parrots Fixed formulations are made with high-quality ingredients from U.S. sources Fortified with 21 vitamins and minerals birds need every day for good health Every pellet contains bananas, oranges, apples and grapes ground from fresh fruit for a great taste Pellets come in 5 different shapes and colors, appealing to your pet’s sense of sight Extruded pellets enhance carbohydrate bioavailability; more digestible than cold-pressed pellets or seed mixtures Naturally preserved Item Specifications: Ingredients: Ground corn, Soybean meal, Ground wheat, Vegetable oil, Wheat germ meal, Sucrose, Dicalcium phosphate, Calcium carbonate, Ground fruit (bananas, oranges, apples, grapes), Iodized salt, DL-Methionine, Choline chloride, L-Lysine, L-ascorbyl-2-polyphoshate, Natural and artificial colors, Artificial flavors, Canthaxanthin, Manganous oxide, Zinc oxide, Copper sulfate, Calcium iodate, Sodium selenite, Vitamin A supplement, Vitamin D3 supplement, Vitamin E supplement, Vitamin K supplement, Niacin, Calcium pantothenate, Pyridoxine hydrochloride, Thiamine, Riboflavin, Folic acid, Biotin, Vitamin B12 supplement Guaranteed Analysis: Crude Protein Not less than 14.0% Crude Fat Not less than 4.0% Crude Fiber Not greater than 3.5% Moisture Not greater than 10.0%. This entry was posted in Birds and tagged 80000, Extra, Flavor, Fruitblend, Part, Small, Zupreem by One Boutique. Bookmark the permalink.